↑ Prum, R.O. & Brush, A.H (March 2003). "Which Came First, the Feather or the Bird?" (PDF). Scientific American. 288 (3): 84–93. PMID 12616863. doi:10.1038/scientificamerican0303-84. Retrieved 7 July 2010. ↑ Prum, Richard O (1999). 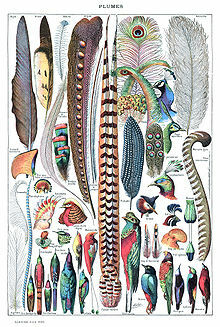 "Development and Evolutionary Origin of Feathers" (PDF). Journal of Experimental Zoology (Molecular and Developmental Evolution). 285 (4): 291–306. PMID 10578107. doi:10.1002/(SICI)1097-010X(19991215)285:4<291::AID-JEZ1>3.0.CO;2-9. Archived from the original (PDF) on 9 April 2011. Retrieved 7 July 2010.